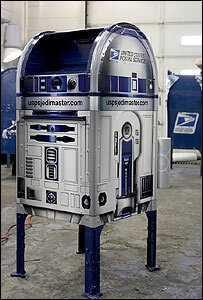 USPS Mailboxes r getting d2′d! What Tolstoy recognizes, and what ultimately makes this the great portrait of occupation, is Hadji Murad’s autonomy. Even by today's standards, this is horrific. Is it even possible to be cynical anymore? You'd have to go out of your way to think of terrible things they aren't actually already doing. Got this from Atrios. Crazy number of instances of Foxisms. Paul frequently points out the fact that every sector of his entertainment world seems to be connected to every other part of it. They Might Be Giants playing songs for McSweeney's who have Jon Hodgman write for them who is then on "The Show with Ze Frank" and also associated with This American Life, and Jon Stewart, who has theme music from They Might Be Giants, so many things overlapping. I think alot of this is happening as a result of the crazy amount of interconnectedness available through la intarwebs. I think in the next 100 years the world will change at a crazy rate due to the possibilities of people with very specific ideas being able to suddenly be a large group where they would have always been a lonely individual even just 10 or 20 years ago. FASCINATING! Sarah found this, too funny. Great article from mother jones about people who get ridiculous gas mileage through crazy driving techniques. It's a really entertaining read, check it out!